Titleist's AP2 and AP3 Black irons. Titleist's AP2 irons feature high-strength Japanese spring steel, called SUP10, that was used to make the forged body and face insert of the 3-6 irons. The 7-iron has a 3-millimeter 1025 stainless steel face insert, while the 8-iron through pitching wedge are forged from 1025 carbon steel for feel and control. Co-forged high-density tungsten — an average of 57.4 grams in each head — is positioned in the heel and toe of the 3-7 irons to increase MOI for added forgiveness and stability. However, instead of using a stainless steel cap to encase the tungsten, a nickel-infused tungsten cap was added that pushes more weight to the perimeter. 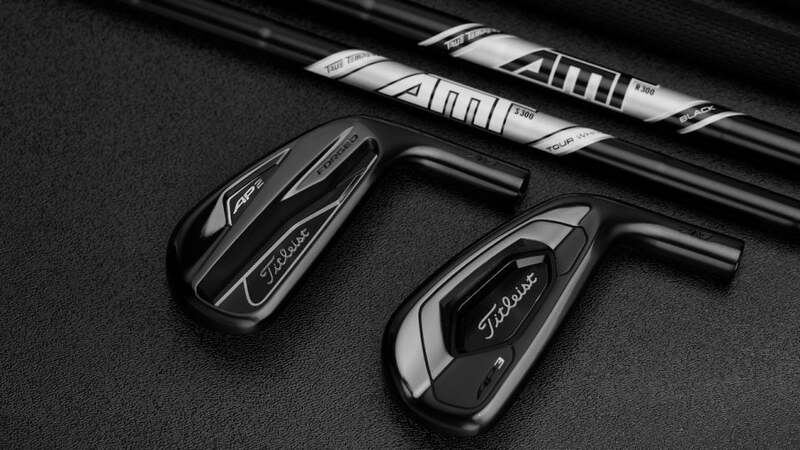 A closer look at the dark finish on Titleist's 718 AP2 and AP3 irons. Titleist's AP3 long and mid-irons (3-7) have a unique hollow blade design (similar to T-MB) comprised of a cast 17-4 stainless steel body and unsupported "L-shaped" 455 stainless steel face (2.1 millimeters). Because the body is hollow and the face wraps under the leading edge, the hitting area will flex more effectively at impact to produce more distance. During testing, a 718 AP3 4-iron averaged 6 yards more carry distance when compared to a 718 AP2 4-iron at moderate swing speeds. The carry distance number should be even higher for higher swing speed players. An average of 84 grams of tungsten was packed into the heel and toe of the 3-7 irons to optimize trajectory and enhance forgiveness. The short irons feature a cast 17-4 stainless steel body and face insert, while the pitching wedge and gap wedge are a solid 17-4 stainless steel casting. Compared to the long and mid-irons, the scoring clubs have some distance characteristics but are designed to offer more feel and control. Titleist’s 718 AP2 Black and AP3 Black irons will be available March 1 and retail for $1,499 (8-piece set).